This was obviously planned, so what the hell was the SCAF thinking? How could they attack and kill Egyptians on the street so casually, while their sole purpose is to protect them from getting killed? How could they risk enflaming the country into a huge sectarian battle by having state Media so conscientiously attacking the Christians and promoting violence against them? How did they not see that the choice they made is an inherently flawed one that it could spell their doom? How do you explain last night? Well, the easy explanation is that they- like every single political force in the country throughout this year- fell into the trap of thinking that they have won and asserted their power, only to have the whole thing blow up in their faces. After believing the political street to be dead, and that the revolution is almost dying, they figured they now have the power to put “people in their proper place” like the old days. So, they went down yesterday to terrorize the Christians, counting that they won’t put up a fight (because they never really did before), and that the sectarian rhetoric will cause them all to fear for their lives, stop them from causing trouble, and quite possibly scare them from participating in the elections. Egyptians are pulling together after a bout of violence at the state television building Maspero, engineered to pit Muslim against Christian and vice versa. The clashes between protesters and the military police during a Coptic protest to demand answers over the burning of churches in Sohag and Aswan resulted in around 25 deaths and 200 injuries. What was schemed as sectarian vandalism and a plot against the unity of Egyptians, has turned out to be a unifying force and a concrete wall to prove that what happened on the night of Black Sunday in Egypt is a Governor versus People clash rather than Christian versus Muslim one. Despite the fact that there are people who still favor sectarianism and believe the army is sacred and can do no wrong, many netizens agreed that what had happened at Maspero was a massacre and an attack on all Egyptians. 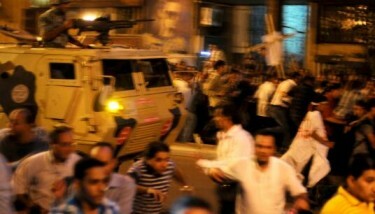 The scene of the armored vehicles attacking civilians in the street brought to the Egyptian minds the infamous scene of diplomatic plated vehicles running people over on January 28, at the beginning of the Egyptian revolution. To add fuel to fire, Egyptian state television played a shameful part in igniting anger by accusing Copts of attacking the army. The aftermath of the bloody night of horror was a bleeding mournful country, 20 plus dead and over 200 injured. On Monday morning, lawyer Khalid Ali won a tiring different battle in the general prosecutor office to obtain autopsy permissions to ensure the blood spilled would not go in vain. The result did not come as a shock. 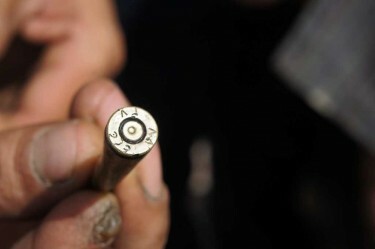 Bullets were shown by relatives of the victims of the October 9 massacre. Photo taken from Arabist Blogpost. While the autopsy was being conducted, people packed up inside and outside the Abbaseya Cathedral in preparation for the funeral procession to honor the souls of the martyrs. The funeral proved that Egyptians both Muslims and Christians were aware of the plot to create a sectarian rift between them. Amidst the prayers, the cathedral broke into blunt and strong chants against the military reign. Following the procession, a march headed from the cathedral to Tahrir Square to pay tribute to activist Mina Daniel who has requested in the ambulance before he passed away that his funeral goes out from Cairo's Tahrir Square, the epicenter of the Egyptian revolution. Egypt: Deadly Crackdown on Coptic Protests by Greek blogger and Global Voices Online author Asteris Masouras. Egyptian journalist Sarah Carr blogs her report on the horrors she witnessed at the Maspero state television building, where around 30 protesters were killed and 150 injured when the military police clashed with Coptic protesters. Der Prophet Mohammed hatte strikte Ansichten in Bezug auf Bankgeschäfte. Das moralisch-ethische Bankgeschäft auf der Grundlage des Korans erlebt Zuwachs - auf Grundlage etablierter Bankphilosophien. Besonders Malaysia ist hier Vorreiter. Es mangelt an nichts - am “Institute of Islamic Banking and Finance” - der Internationalen Universität von Malaysia. Der Computer-Pool, die Seminarräume, das Studentenwohnheim - alles hochmodern, alles perfekt ausgestattet. Untergebracht ist das “Institut für islamische Bank- und Finanzgeschäfte” auf dem weitläufigen Gelände einer alten Villa in einem der besseren Vororte der malaysischen Hauptstadt Kuala Lumpur. 120 Studierende forschen hier - zwei Drittel davon sind Ausländer. Saudis sind darunter, Indonesier und Doktoranden aus Bosnien. “Die Nachfrage ist enorm”, betont der Dekan des Instituts, Azmir Omar. Allein letztes Jahr hätten sich 400 Nachwuchswissenschaftler auf 40 freie Plätze beworben. “Islamic Banking” - auch “Sharia Banking” genannt - wurde 1983 in Malaysia eingeführt - gut zwei Jahrzehnte, nachdem in Ägypten erstmals Banken damit experimentiert hatten. “Gott hat den Kauf erlaubt und den Riba verboten”, heißt es im Koran in Sure II Vers 275. Riba steht für den Zins. Wie Jesus war auch der Prophet Mohammed gegen die Zinswucherer seiner Zeit vorgegangen. Das Verbot, Geld zu einem festen Zins zu verleihen, gilt bis heute. Genauso wie es als unethisch gilt, zu spekulieren, betont Rithuan Mohamed Shamsudin, der Direktor der Vereinigung islamischer Banken in Malaysia, kurz IBIM. Die über zwanzig Banken in Malaysia, die entweder rein islamisch sind oder sogenannte “islamische Fenster” haben, bieten ihren Kunden Finanzdienstleistungen auf Basis zinsfreier Transaktionen an. Anstatt ihnen Zinsen zu versprechen, werden sie an den Bank-Gewinnen beteiligt. Immer mehr Malaysier nutzen dieses Angebot. “Islamic Banking” bringt es inzwischen auf einen Anteil von 20 Prozent am Gesamtmarkt, Tendenz steigend. Das bekräftigt auch Asyraf Wajdi Dusuki von der “International Sharia Research Academy for Islamic Finance” - kurz ISRA genannt. ISRA ist ein relativ neuer Spieler auf dem Feld der islamischen Bankgeschäfte. Das Forschungsinstitut wurde vor gut zwei Jahren von der malaysischen Zentralbank ins Leben gerufen - um Islamic Banking weiter zu “professionalisieren”.